Authorities say Douglas Alward had broken out of prison three times before his latest escape. 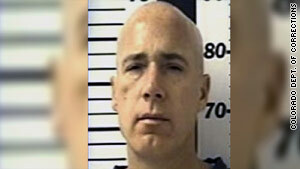 (CNN) -- A Colorado convict serving time for attempted murder was recaptured Wednesday after breaking out of prison over the weekend, and a female hostage with him was released unharmed, prison officials said. Douglas Alward was caught near Yuma, Colorado, about 145 miles east of Denver and about 50 miles south of the Sterling Correctional Facility he broke out of Sunday, prison spokeswoman Katherine Sanguinetti told HLN's "Prime News." Alward, 48, was serving a 20- to 40-year term for attempted murder, assault and kidnapping and had broken out of prison three times before, Sanguinetti said. He was up for parole in October, according to prison records. Investigators found him in a trailer near Yuma about noon Wednesday. He surrendered once confronted, releasing the woman with him without injury, said Ari Zavaras, executive director of the Colorado Department of Corrections. Zavaras said searchers tracked Alward to a 4-square-mile patch of cornfields outside Yuma on Wednesday morning. "He didn't offer any resistance, let alone armed resistance," Zavaras said. Zavaras released few details of the escape, but said an investigation into how Alward broke out of the maximum-security facility was under way. He promised a "top to bottom" review was in the works. He said Alward "breached" the fence around the facility somehow, and some tools used in the breakout were found nearby. The fence was not cut, he said. Prison officials are looking at how Alward obtained the tools, but don't believe he had outside help, Zavaras said. Kevin Milyard, the prison's warden, said a guard noticed something wrong within an hour of the breakout, and an emergency head count quickly confirmed Alward was missing. Alward is facing a likely charge of escape and other charges that remain to be determined, Zavaras said.